Please refer to Help:Editing in order to write a quality approved article. 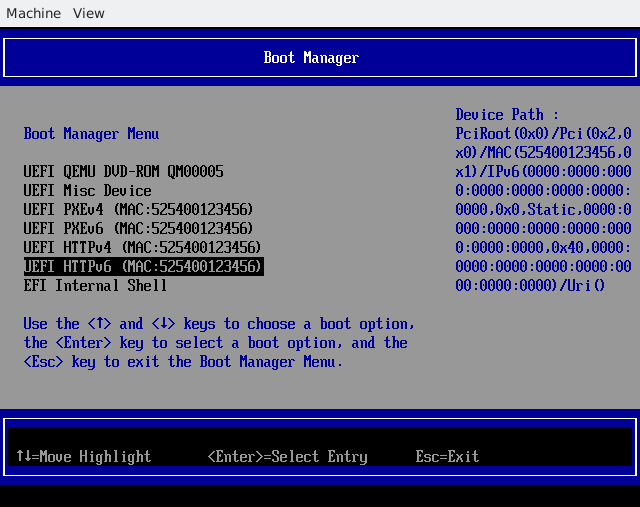 HTTPBoot was added into UEFI SPEC since 2.5, and it aims to replace PXE and provides more features. Actually, the concept of HTTPBoot is similar to PXE. It starts with the HTTP URL from the DHCP server and fetches the data with the HTTP protocol. Besides, HTTPBoot also supports DNS. With DNS, the firmware and the bootloader can resolve the domain name so it's possible to pass a well-known HTTP URL to download the image across different domains, while tftp (PXE) is only for the local network. This article provides the HOWTO to set up the HTTPBoot server. We also provides the instructions to create a virtual machine with HTTPBoot support in case you don't have a new enough physical machine. The HTTPBoot server has to install at least the following packages: dhcp-server, apache2 (or lighttpd), and dnsmasq. NOTE: This article uses the IP subnets 192.168.111.0/24 (v4) and 2001:db8:f00f:cafe::/64 (v6) and assumes the server IP addresses are 192.168.111.1(v4) and 2001:db8:f00f:cafe::1/64 (v6). Please adjust the related settings in case any conflict exists. Enabling HTTPBoot in the firmware is vendor specific. Please refer to the manual of the mainboard or the machine. To set up a virtual machine with the latest UEFI, the host needs qemu and OVMF. 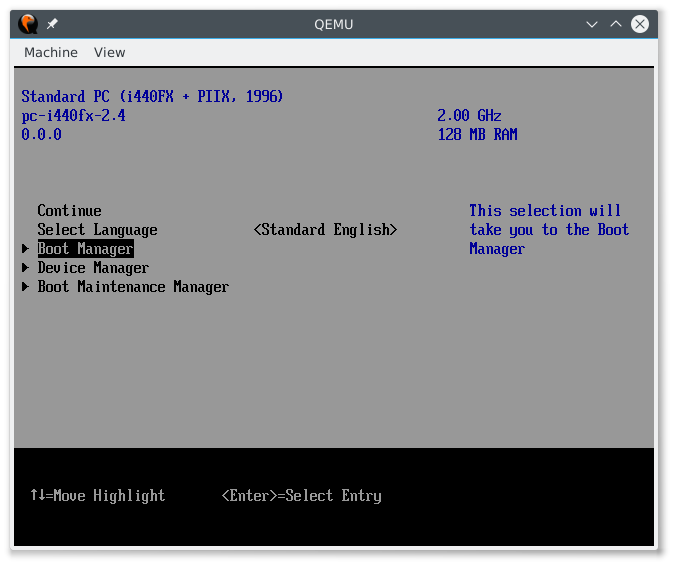 OVMF is the UEFI implementation for qemu. For the better support of HTTPBoot, it's recommended to use ovmf >= r18743. Just install qemu-ovmf-x86_64 which contains the firmware files for qemu. 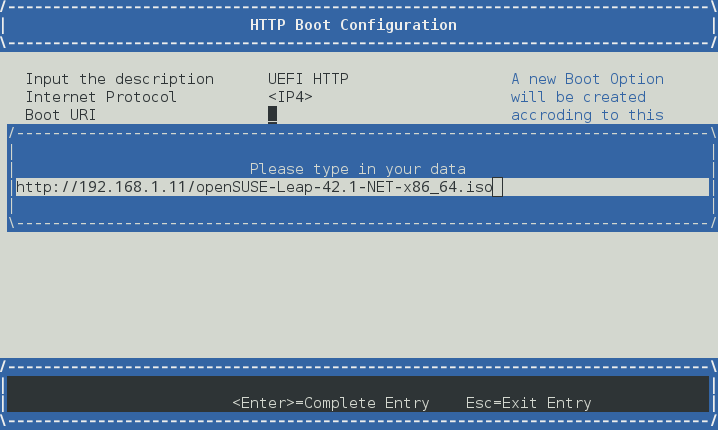 SUSE Linux Enterprise starts to support HTTP Boot since 12-SP3 and HTTPS Boot since 15. For openSUSE, you need Leap 15.0 or higher to support HTTP Boot and HTTPS Boot. There are lots of possible networking scenarios. For the beginner, it's recommended to start with the isolated network to avoid breaking the physical network. There are several networking settings in qemu. The tap networking is the best choice since it utilizes the virtual interface to achieve the two way communication between the host and the guest. It provides a completely isolated network as long as we don't bridge the virtual interface with any real one, so that our testing dhcp server won't mess up the local network. In this scenario, we assume the host is the HTTPBoot server and the guest is the client. First, we set up the a tap interface for the communication between the host and the guest. If the firewall is enabled, it's recommended to add tap0 to the "Internal" or "Trusted" zone to avoid the port blocking. NOTE: When using the isolated network, remember to replace eth0 with tap0 in the server configuration later. A HTTPBoot server acts as a normal DHCP server in the physical network except providing the image download function. Please adapt the related settings in the following sections for your network settings. For the client, there are two choices: a physical machine or a bridged virtual machine. Just check the firmware manual or UI to see if it supports HTTPBoot or not. In case you don't have any new-enough machine as the HTTPBoot client, one choice is to bridge the virtual machine to the physical network. Assume that the host connects to the network with eth0, we can bridge eth0 and tap0 with br0, and then the virtual machine can send/receive packets through br0/eth0. It's recommended to use YaST to create and manage both tap and bridge interfaces. See the section in Leap document (Managing Network Bridges with YaST) for more information. 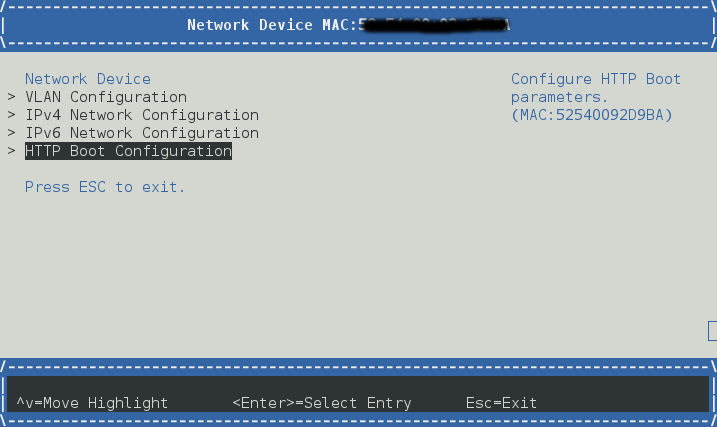 Once the bridge(br0) is set up, configure the network settings on br0 and then both the host and the guest can access the network. Now, it's time to start the DNS server. NOTE: UEFI 2.7 changes the device path of HTTPBoot and inserts a DNS node, and it's recommended to use shim bootloaders from SLE15/openSUSE Leap 15 or newer to avoid the potential errors due to the additional DNS node. Then, the DHCP servers will only provide the service on eth0. First, we match the identifier from the client to tell what kind of service it requests. For HTTPBoot, the DHCPv4 server MUST use "HTTPClient" for option 60 since the client use it to identify whether this is a HTTPBoot offer or not. 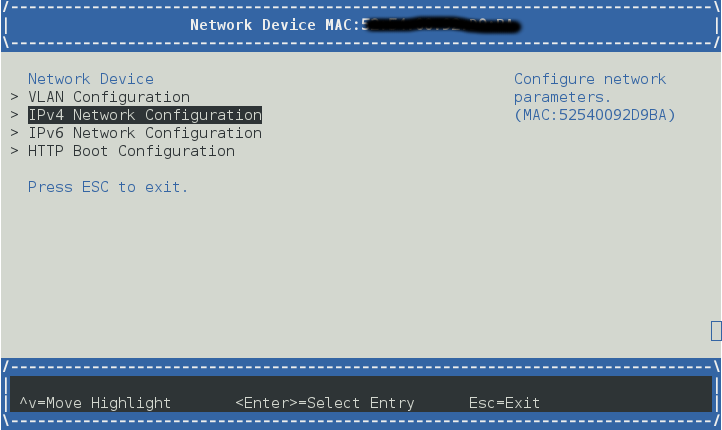 NOTE: Due to a bug(*) in shim, you might see "Invalid Parameter" from shim if the gateway (option routers) is not set. First, we define the type of the boot URL and the vendor class and then set the details. Like the DHCPv4 settings, we have to assign the boot URL. Please note that we have to use the IPv6 name in the boot URL. Similar to option 60 in DHCPv4, we have to specify the vendor class. The vendor class option in DHCPv6 consists of the enterprise number and the vendor class data (length and the content). The HTTPBoot driver doesn't care the enterprise number, so we just use 0. The content of the vendor class data has to be "HTTPClient", or the client will just ignore the offer. Now start the DHCPv6 daemon. Then the server can serve different architectures at the same time. 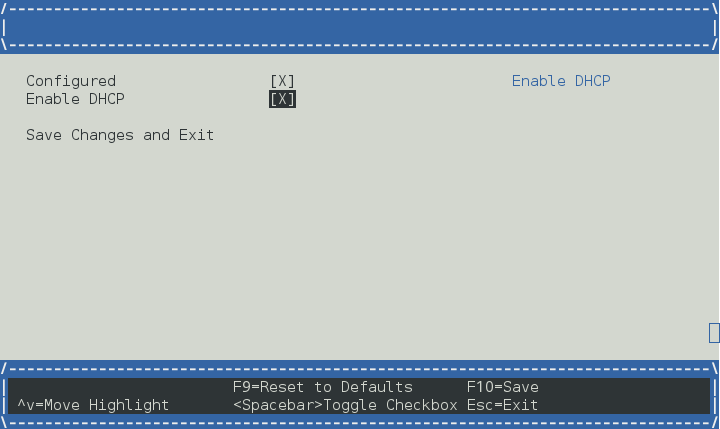 openSUSE/SLE now provide a special package, tftpboot-installation, for PXE. For example, just install tftpboot-installation-openSUSE-Tumbleweed-x86_64 and the Tumbleweed bootloader and related files will be installed in /srv/tftpboot/openSUSE-Tumbleweed-x86_64/. Read /srv/tftpboot/openSUSE-Tumbleweed-x86_64/README for more information. The SLE Deployment Guide(*) may provide more information for the installation server setup. When server.use-ipv6 is enabled, it would make lighttpd only listen to IPv6, so we remove it and add an new IPv6 section with the default options. Since we choose "www.httpboot.local" as our domain name, please use "www.httpboot.local" for "Common Name". Please note that this certificate is only for testing and NEVER use this certificate in the production machine. You have to enroll the server certificate (server.der) in the client side before using HTTPS Boot or the client would fail to connect to the server. The method to enroll the server certificate depends on the implementation of the client firmware. To enroll the server certificate into a physical machine, you may need to plug in a USB stick which contains the certificate file and enroll it manually with the firmware UI. On the other hand, some high-end servers with Redfish support can enroll the certificate remotely. For example, the HPE iLO5 manual provides the instructions to enroll the certificate through its Restful API. OVMF provides a menu in "Device Manager" -> "Tls Auth Configuration", and the user can enroll the server certificate from a file accessible to OVMF. Besides enrolling the certificate manually, it's possible to configure the trusted certificates for OVMF with "-fw_cfg". Since 9c7d0d49929, OVMF supports reading the certificate list from the fw_cfg entry, etc/edk2/https/cacerts. The certificate list has to be in the format of Signature Database. Check more details in the "HTTPS Boot" section of OVMF README. Since lighttpd needs the private key and the certificate in the same file, we have to unify them first. NOTE: Due to the change of packaging, openSUSE Leap 15.0 or the higher need to enable the openssl module explicitly while lighttpd in openSUSE Leap 42.3 or the lower builds in the openssl module in the lighttpd binary. Restart lighttpd to activate SSL support. Before we start to configure apache, we have to check /etc/sysconfig/apache2 first. The SSL support of apache is controlled by APACHE_SERVER_FLAGS, so we have to add the SSL flag. APACHE_MODULES="actions alias auth_basic authn_file authz_host authz_groupfile authz_core authz_user autoindex cgi dir env expires include log_config mime negotiation setenvif ssl socache_shmcb userdir reqtimeout authn_core headers proxy proxy_http proxy_wstunnel"
Next, copy the private key and the certificate to /etc/apache2/. Create the ssl vhost configuration. Last, remember to replace the "http://" prefix with "https://" in the dhcpd.conf/dhcpd6.conf and restart the dhcp server. Since we create a self-signed certificate for our HTTPS server, if we specify the HTTPS url in grub.cfg, the SLE/openSUSE installation system may fail to verify the certificate and refuse to download files from our HTTPS server. drwxr-xr-x   3 johndoe  users           0 Sep  3 10:09 . If the settings are good, it will bring up dhcp, dhcp6, dnsmasq, and lighttpd services on the given network interface and make them ready to test. If the firmware already supports HTTPBoot, just plug in the cable and choose the correct boot option. Now it's time to set up a virtual machine as the HTTPBoot client. There are a few qemu options needed to create a UEFI virtual machine. Please note that ovmf-x86_64-vars.bin must be writable. Just copy /usr/share/qemu/ovmf-x86_64-vars.bin to the working directory. Since the host uses tap0 to communicate with the guest, we must specify the interface. "romfile=" is to disable the iPXE support so the virtual machine will use the native PXE and HTTPBoot functions from OVMF instead from iPXE. 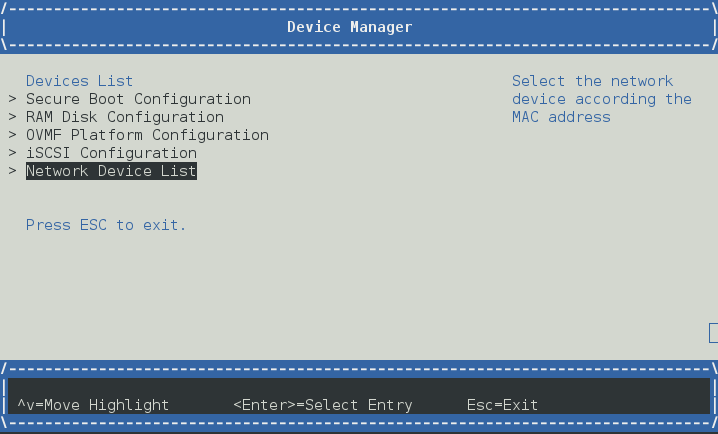 When the TianoCore logo shows, press "ESC" to enter the firmware menu. Press "DOWN" to go to "Boot Manager" and press "Enter". There will be several boot options. Choose the boot option with the "HTTP" prefix. Just choose one of the boot options, and the firmware will start to download your UEFI application and execute it! Another way to test http boot is to download a iso image from a URL. The benefit of this way is that you don't need to setup DHCP on host machine, and it only needs http server. 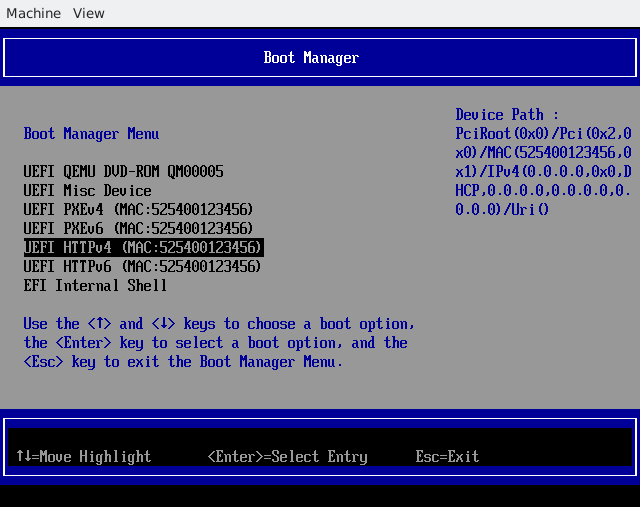 Create a boot option by "HTTP Boot Configuration"
This page was last modified on 7 March 2019, at 07:54.